This paper includes understanding of organizational framework models, understanding of strategic, operating and support processes in an organization along with typical value chain components – including planning & budgeting, procurement, vendor management, inbound logistics, manufacturing operations, marketing & selling, and after-sales service. The paper will enable detailed learning of all business processes individually and establish linkages across processes. To make the learning experience relevant we will provide this overview, cutting across industry segments like retail, manufacturing, services, hospitality, banks and telecom, among others. The paper will focus on the art of developing process maps for each sub-process, drafting process activities, use of aesthetics and employing industry-accepted symbols for inputs, outputs, interfaces, activity owners, etc. It will also cover nuances in each business process for various industry verticals such as Retail, Service, Hospitality, Financial Services, Telecom, and Manufacturing. Effective depiction of any organization’s current business processes makes for easy and accurate understanding, and is often the first step to getting to recognize gaps, risk and potential improvement opportunities. The paper will impart a detailed understanding of the globally accepted COSO (Committee of Sponsoring Organizations of the Treadway Commission) framework on internal controls and explain the role of an audit committee to ensure strong governance standards. The paper will bring out the best practices in internal audit execution methodology, including developing an internal audit plan, scoping, interactions with auditee stakeholders, elements of process understanding, interviewing techniques, 5W analysis, sampling techniques, effective use of analytics in audit, work-paper documentation, importance of management and executive leadership reporting, including format and guidelines, attending management committee and audit committee meetings. The paper will provide a holistic approach to management of business risks through controls, development of risk & control matrix (including control objective, type of control, control ownership definition and frequency of controls), evaluation of control design and effectiveness. The paper will focus on bringing out risks in typical business processes – source to pay, order to cash, inventory, fixed assets, human resource & payroll and best practice controls to mitigate the business risks effectively. The curriculum also includes appreciation of the elements called out in this paper in different industry segment context, similar to the explanations for Business Value Chain and operating models. This paper will consist of a refresher course on accounting fundamentals, understanding operational controls vis-a-vis financial reporting controls, assertions of financial statements, understanding fundamentals of ICFR or Sarbanes-Oxley (‘SOX’) requirements, SOX planning, SOX audit methodology (scoping, process understanding, documentation, design testing, effectiveness testing, deficiency reporting & remediation), concepts of materiality, material weakness and significant deficiencies. The paper will focus on understanding of the objective of an enterprise, the types of risks impacting the enterprise, and establish a link between the two. The paper will include various concepts of risks, such as inherent risk, residual risk, impact/ likelihood and velocity of risks, and effective use of controls as risk mitigants. It would also touch upon concepts of risk tolerance and the development of risk scales for an organization, and monitoring and reporting practices of risks in an organization. This paper focuses on deeper understanding and application of concepts of ERM with break-out sessions to facilitate groups to do in-depth studies across various industry verticals, such as Retail, Service, Hospitality, Financial Services, Telecom, and Manufacturing. The learning experience will take students through the entire journey of preparing Risk Heat Maps capturing Inherent and Residual Risks, including drivers for movement of Inherent Risk to Residual Risk and implications of residual risk being higher than the risk tolerance level of the organization for a particular type of risk. 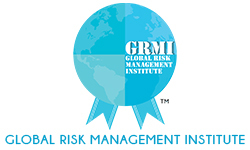 GRMI prides itself that this would be the kind of domain expertise gained from experiential learning that sometimes even senior leaders in consulting and corporates in India and globally currently struggle in. This paper will focus on understanding concepts of the market, credit, operational and treasury risk in an enterprise, including measurement and monitoring of such risks. The intent is to provide an overview of how financial institutions view risk. Given that Risk Management in the financial services world is quite evolved, we will have optional specialization papers, should students choose to pursue any specific area such as Market or Credit Risk in greater depth. This will assist in an understanding of the relationship between financial and operational risks with IT controls, concepts of IT general controls, IT application controls, and in the effective use of IT general controls in mitigation of business risks. The key focus of this paper is to ensure that PGDRM graduates should never have to struggle trying to operate around the information system of an organization instead of operating through the information system. The paper will not only explain the concept of data analytics and use of data analytics tools such as Excel, Access, ACL, SPS, etc. but also give detailed concepts on application of data analytics for managing risks across business processes such as source to pay, order to cash, fixed assets, inventory etc. Along with ERM We consider this paper to be one of our significant differentiators in terms of what it does to enhance analytical thinking in risk and business context. It is the ability to link the impact of error across various links of a business value chain, and the ability to convert mass of mega data into intelligent and relevant information for effective risk decision making. The paper will cover the key regulatory risks facing global conglomerates – Anti Bribers’ risks (governed by the Foreign corrupt practices Act, UK Anti Bribery Acts, among others), Money laundering risks (governed by AML Acts), and other industry-specific regulatory compliance risks. The paper will focus on regulatory requirements for managing such risks, and development and execution of control frameworks to assess, mitigate and monitor such risks. It will also bring out the concept of four lines of defense in an enterprise, role of the Board of Directors and CXOs in Risk Management, and the liabilities of Directors. This paper will focus on brining out the enhanced focus of organizations in using technology and automation to drive efficiency and effectiveness in different aspects of Risk Management including but not limited to Internal Audit, Sox testing, Regulatory compliance, Analytics etc. The paper will include the best in class digitized tools and techniques currently being used by organizations to give a practical perspective.